The Asus Padfone looks a bit like sci-fi - it’s a combination of a smartphone and a tablet, but not a fully-functional slate, but rather chassis powered by the smartphone. It’s something like the Lapdock, powered by recent Motorola phones, but instead of a keyboard-equipped chassis, this one is just a tablet. The good news about the Asus Padfone? It will come with Android Ice Cream Sandwich! The not so good ones? It will be delayed until early 2012. The timing, though, isn’t exactly final, it’s more of an approximation, which might change. Asus’s Johnny Shih said the company is working with carriers and that’s the biggest swing factor for the final release date. We looked at the Padfone back in early June when it was announced, and the idea definitely made sense to us, but we all know that it’s the actual product and its performance that matter the most. The Lapdock idea also seemed brilliant at the beginning but with an inflated price tag of the dock itself and a very unresponsive interface, it was not quite ready for mass adoption. 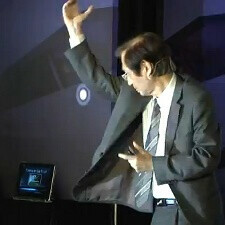 Will the Asus Padfone be different? Feel free to share your expectations in the comments below. That way a crazy weird introduction...but still kinda cool! It would be better if we could just dock or phones into the pad and make it a padphone. Rather than have the pad always be a phone, because then we would need two phone lines, which means, two calling plans, two bills. two times the expense.